Cold, windy, poor vis… why would you do the IDC in the UK? I certainly didn’t want to! I planned to complete the instructor development course in Hurghada, a place I know well and have dived many times. Warmth, sun, fantastic visibility… all things I couldn’t get in the UK. But the schedules didn’t fit. So I signed up in the UK and haven’t looked back since! Initially the idea of completing the IDC (instructor development course) followed immediately by the IE (instructor examination) was appealing. I wanted to “get it done”. With hindsight the time taken to go through the learning has contributed to my development immeasurably. I completed the AI (assistant instructor) course in June. This was locally and I buddied up with another student who was continuing to the OWSI (Open Water Scuba Instructor) course. Between the two courses and the IE I buddied up to practise skills, and to DM (dive master) on courses to build up experience and knowledge. I was able to study the theory fully which has prepped me better for instructing the dive master course and specialities now I am an instructor. There were people from five different dive schools on my IDC, coordinated by Alex Griffin. This was a great networking opportunity. I have since instructed for a couple of other schools which is a superb experience, learning from a range of more experienced instructors. I was offered pool sessions by all the dive schools that were involved in the IDC. This greater flexibility meant more practice and better preparation for the IE. 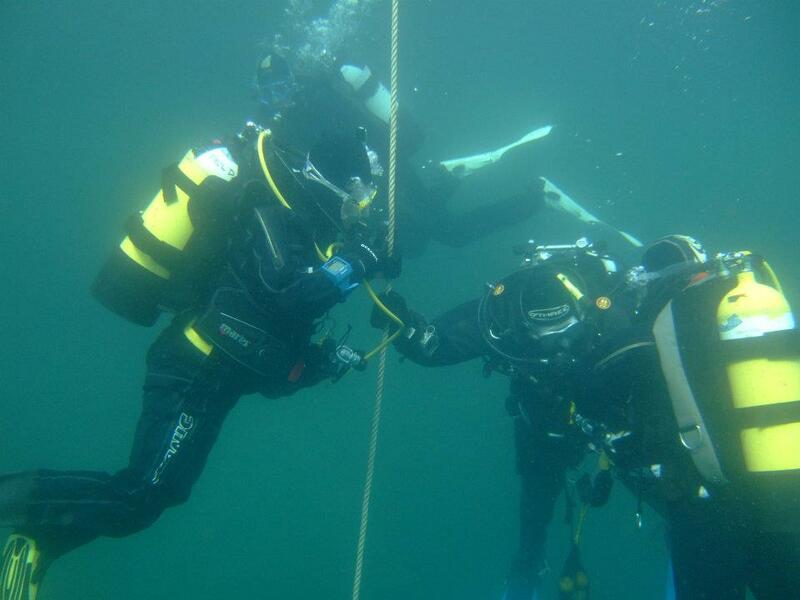 I have since created stronger links with another local dive school to buddy up when running courses. We are sharing surface cover, and can combine courses if we have only one student. They are offering me support with the courses with which I am less experienced and we can pool resources. Learning locally meant diving in open water sites I knew well. This was invaluable in terms of support. I know a few CDs (Course Directors who run instructor training) in Hurghada and they are fantastic, but the support from a huge range of people near to home was invaluable. They helped in a range of ways from replacing kit, to refilling the cylinders at the end of the day. Cups of tea, and being my practice students all contributed to making the IDC and IE a fairly enjoyable experience! It was also great to be able to travel home at the end of the day and relax. There are challenges unique to locations. Learning locally took me through these challenges. I am instructing in the UK. The experience of training to teach in the same locations that I will be using has greatly supported my preparation. I ran through all the skills from briefing to debrief as both an instructor and a student during the training. We were given tips on how to the run the training and this continued to the specialities training when I completed this. I felt completely prepared to run the training in the specific locations. Although we are certified as dive instructors (and not dive instructor who can teach in lake X only) site knowledge can help a course run more fluidly, especially when you’re starting out! I have continued to liaise with my course director. I completed my specialities training with Alex a couple of months after the IE and I have been able to ask the odd question here or there if I’m unsure of anything. I will continue to develop as an instructor but also for my own recreational diving; tec diving is the next step so I can access the dive sites that have hitherto been inaccessible! Having this link with my trainer in the location where I work has enriched my diving both professionally and personally. The sticky old issue of cost. If you’ve read my blog on choosing a dive school then you’ll know I’m not a fan of choosing courses based solely on the cost. It’s about value for money. Initially it seemed the IDC abroad would be cheaper. However, when you add in travel costs and accommodation the local option was better for me. There were some on the course who booked a hotel for the weekend of the IE to save travelling home, which added to their expense. Overall the additional practice time, support and development gave me great value for money here in the UK. There is a uniformity in training that is required so it isn’t that one place is necessarily better than another. The best instructors that I know here in the UK trained abroad. It’s just worth looking at a range of opportunities for your training – don’t just write off the UK! It can offer brilliant training, albeit that you’ll need a few mugs of tea between sessions!